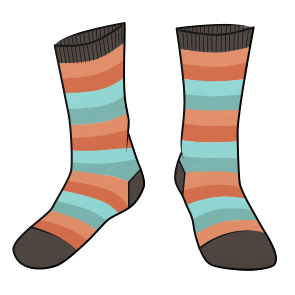 Striped Sock Design Contest with Betabrand... Color Palettes On Your Feet! Here we are again COLOURlovers! 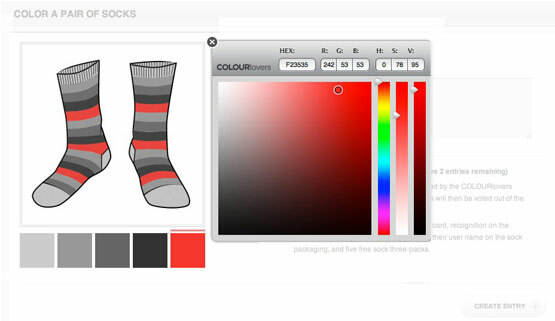 Get your Color Caps on and start putting together some amazing palettes for some way cool, striped socks by Betabrand! Just think about it, this Winter you, your fellow COLOURlovers and the rest of the world could be wearing one of your palettes on their feet! We were stoked to work with our friends at Betabrand on the COLOURlovers Plaid Flannel Shirt and we're even more stoked to get the chance to work with them again on these awesome socks! Browse the Contest Gallery | Create a New Entry Now! The Striped Socks Contest ~ 3 Winners! The contest will be open one week, from September 14th - 22nd at 12:00 AM PDT. The 30 most LOVED entries will then move on to further voting at Betabrand.com. You can either browse through the most wonderful palettes you've already created and enter one of those... or get freshly inspired to create a new perfect palette to hug some toes. You can easily submit a current palette in your collection by going to your palette's information page. Notice on the RIGHT column there is a nifty pair of socks just chill'n out with your palette on them. Just click the button, "Enter Betabrand Sock Contest." 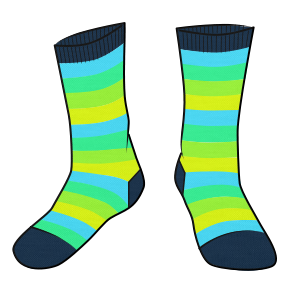 Go to the Striped Socks Entry Page, and when it loads all you need to do is click one of those gray squares under the socks to start making your masterpiece. 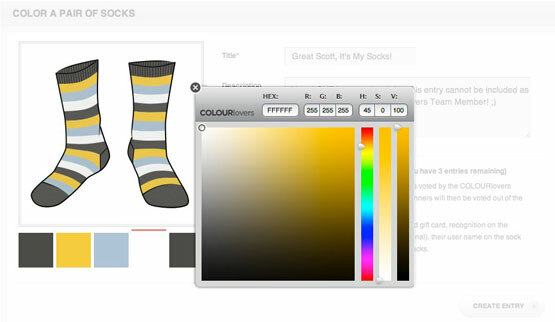 Each time you select a color the sock template will refresh with your new color to give you a live preview of what your finished product will look like. You can even drag the color squares (right-left) to rearrange the colors to get your stripes just perfect. When you're done deciding on a palette and layout of your stripes. Fill out the title and remaining information (optional) and hit the CREATE ENTRY button. And there you are! Give yourself a high-five and LOVE your design. 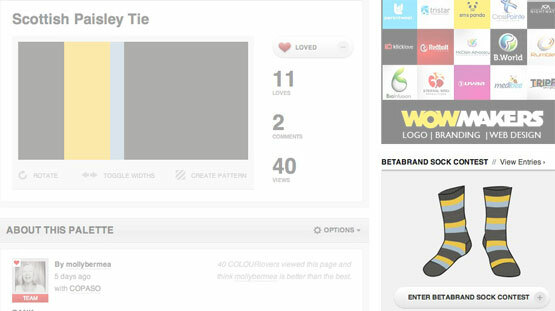 We've provided additional social tools (twitter, Facebook, Google and StumbleUpon) to help you share your creation with your friends and boost your loves… remember that since the 30 most loved designs will move on to the finalist round over at Betabrand you'll want all the love you can get! Don't forget we're all about the LOVE, so feel free to cruise around and love some of the other designs in The COLOURlovers Striped Socks Gallery. Winners will receive a $100 Betabrand gift card, their username on the sock packaging, five free sock three-packs and recognition on the Betabrand site in photos/videos (when able). But you don't have to wait until the winners are announced to start building your COLOURlovers wardrobe. Betabrand is letting people pre-order both the CL Plaid Shirt & CL Striped Socks at a very nice discount… Click either of the links below. woooohoooo! This is going to be fun! Can Anyone Tell Me What Happen? What seems to be the problem? What exactly isn't working for you? There was an error while adding this entry! What palette are you trying to use? @Peabert: Betabrand ships internationally... So I think so. I bet it was Molly, that saucy minx. Can you try again? I think we've fixed the problem. Could you let me know either way? Thanks! What we REALLY need now is a box-short competition because so far my COLOURlovers outfit isn't appropriate in public. Yes... but any sort of short / pant would work. And we know some of you won't want the duplicate palettes on your profile and after the contest ends you can use the delete feature to remove them. I can't tell.. do you need an account to be able to vote? If I log out, I am allowed to click Love This. But as far as I can tell, the Love count does not increase. May I Know What Website That I Can Look For Pantone Convert To CMYK? I accidently created an entry with the default greys by accident? Is there a way to delete an entry I created? Well an extralarge shirt ( for girls) can be a nightgown and the socks are aka/slippers and feet warmers! :) - I guess one could go outside to get the newspaper!